We are in the midst of massive remodeling here on our mountain. I realize that massive is a relative term. 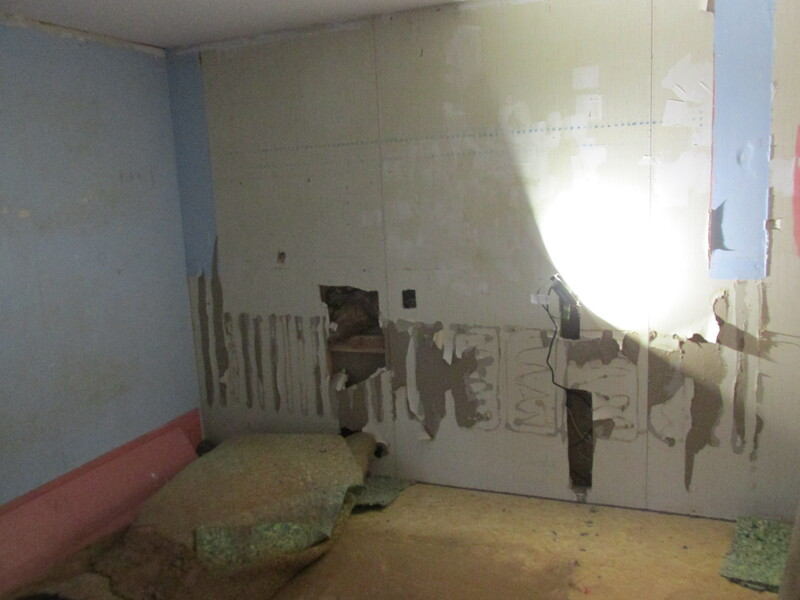 For us it means that one bedroom is getting a complete overhaul: new sheet rock, electrical, and floors. 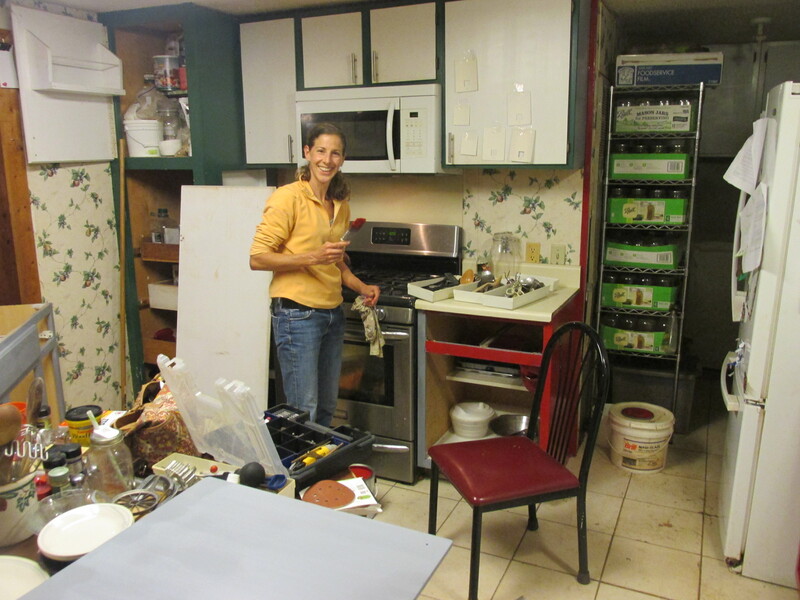 Simultaneously we are remodeling the kitchen. All this has to be done in the next ten days. The bedroom by Saturday AM and the kitchen by next Tuesday. Thanksgiving is soon to arrive, bringing with it a house full of love and laughter as all my children come home. And Dee is expecting her little bundle of joy in another five weeks, so we are trying desperately to get the room finished so we can get the girls all straightened out. Right now we are in the midst of moving Star Child out to her grandparents (part time–mostly her stuff, but we will still get to see her now and again) while also trying to get Gladys Mae and Little Princess into the room Star Child and Dee are leaving. And of course, all of Dee’s possessions are still in that room. Boxes and furniture are everywhere. It basically looks like a tornado came through and vomited several bedrooms into a tiny space. It is ugly, and it is slightly terrifying to walk down their hallway as the extra bookcases piled high with boxes feel like they are closing in on you as you approach. All this will soon be sorted–some of it to storage with Lindy, some of it to Star Child’s new digs (but temporarily in storage until she can move in over Christmas), and some of it just rearranged to fit into its new space. But for now, the growing pains involve disaster. As a friend said, it has to get worse before it gets better. 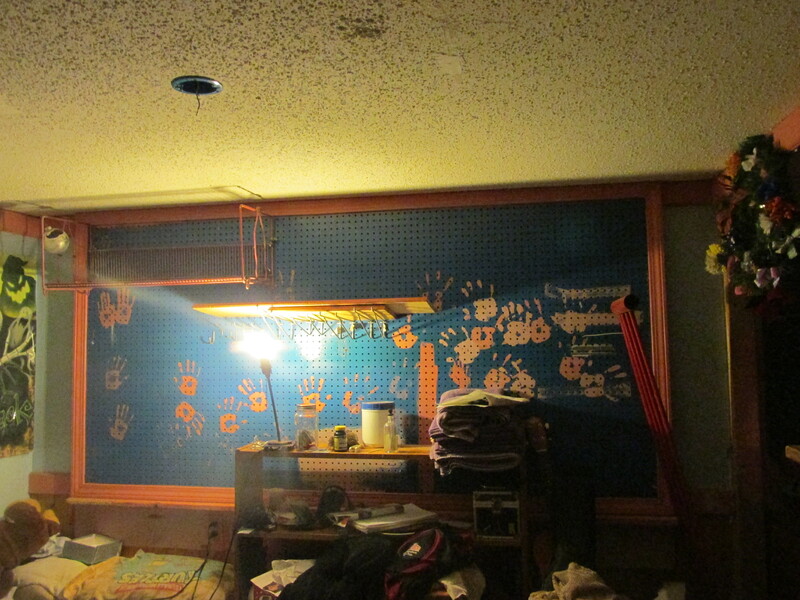 This peg board had to come down. Dee’s new room. It left quite a mess. New sheet rock is in order! The Handy Man has been diligently working on the bedroom. First they removed the 26 year old carpet. Can you say gross? Next, he crawled under the house for the better part of yesterday trying to locate the problematic wire that was causing the light switch and outlet not to work. Mobile homes are not assembled in anything that seems to approximate a plan. One wire came from the marriage joint, doubled back for no apparent reason, and then ended up near the outside wall. A gnawing rodent had severed the wire on both sides of the marriage joint. The silver lining in this was that there was so much extra wire stapled up in that seemingly random way that the Handy Man was able to use that and just put in a junction box. He is handy that way! 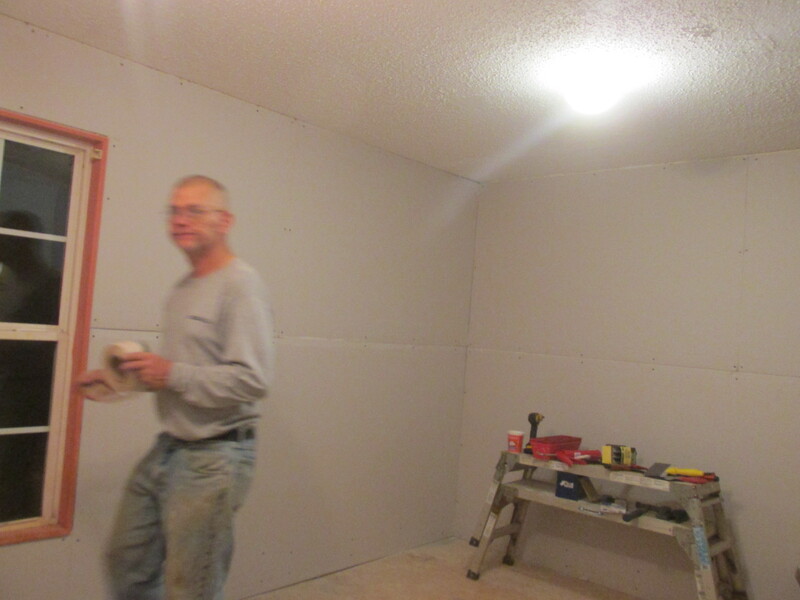 Right now the Handy Man is teaching Gladys Mae how to hang sheet rock. She is learning how to measure it, cut it to fit and attach it to the wall. She may get enough practice in for it to count towards a shop credit! I wonder if they even offer shop classes anymore…. Pulling carpet staples. 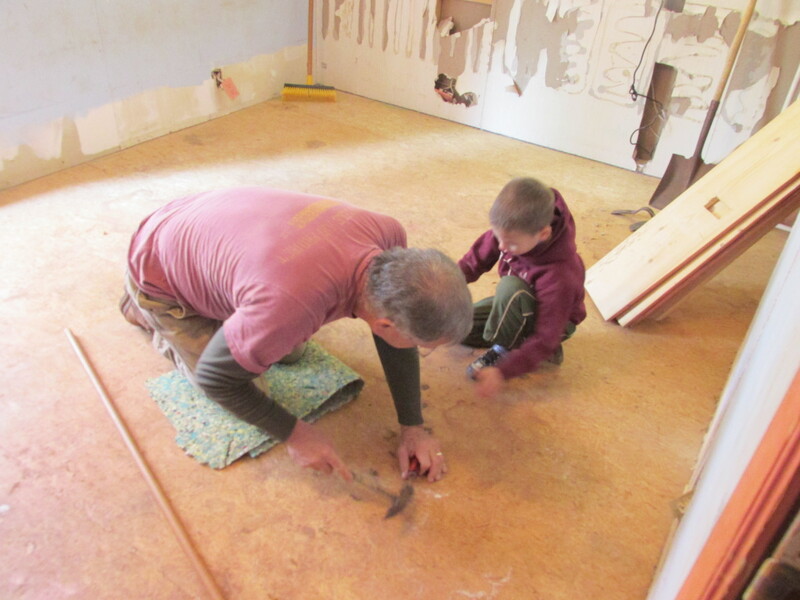 The Handy Man has a Curious George helper. Body removal? The perfect murder? No…just really old and nasty carpet! He is handy. And he is a man. And he does sheet rock. A dear friend volunteered to do the bedroom for Dee. She is decorating it once we have the blank canvas ready. I cannot wait for the revealing. She will remain anonymous until this all comes together. We have a date on Friday to go to Ikea with my mother, aka Omie, to check out Billy shelves (I need at least four, but I may get six) and mattresses. That should be a fun day! The kitchen, meanwhile, has been mostly my domain. 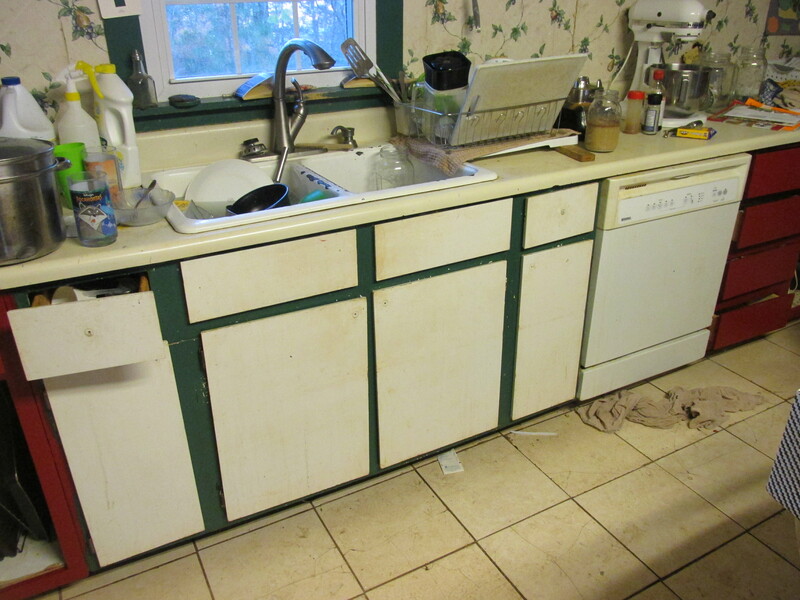 I will need the Handy Man when we replace the sink base cabinet, hang the new bead board, and install the new counters. 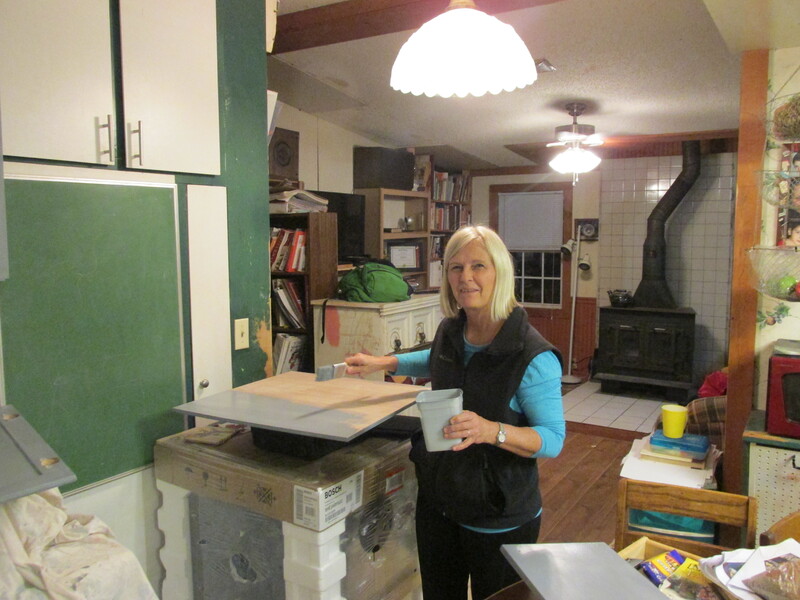 I have had some help sanding the cabinets, priming the cabinets, and now painting the cabinets. My mother in law asked me today how we got started. I had to laugh. It all started with a rotten counter. 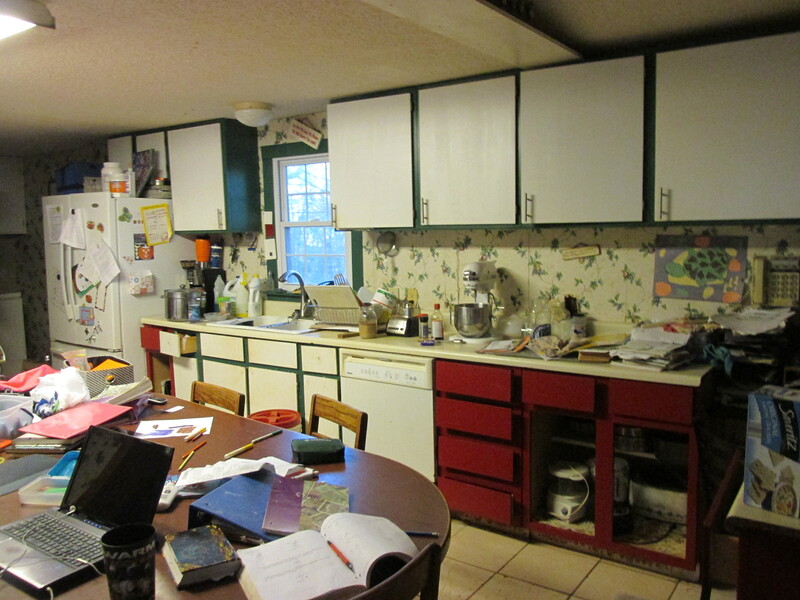 We remodeled our kitchen and living area about fifteen years ago. We expanded the kitchen and installed new counters and cabinets. The sink was set, but before it was dry my father leaned against it, and unbeknownst to us (at the time) the sink never sealed properly. Fifteen years later, and the counter and base cabinet are toast. So I needed a new counter. I have repainted my kitchen a few times, but never like this. At first our kitchen was all almond. Almond is a terrible color for a kitchen! It looked dingy all the time. So then I went with green cabinet frames and white doors. And I liked it for a while, but having boys has taught me that white anything where little boys’ grubby paws hands can freely touch will soon look Georgia Red Clay colored. It is a color. Trust me. 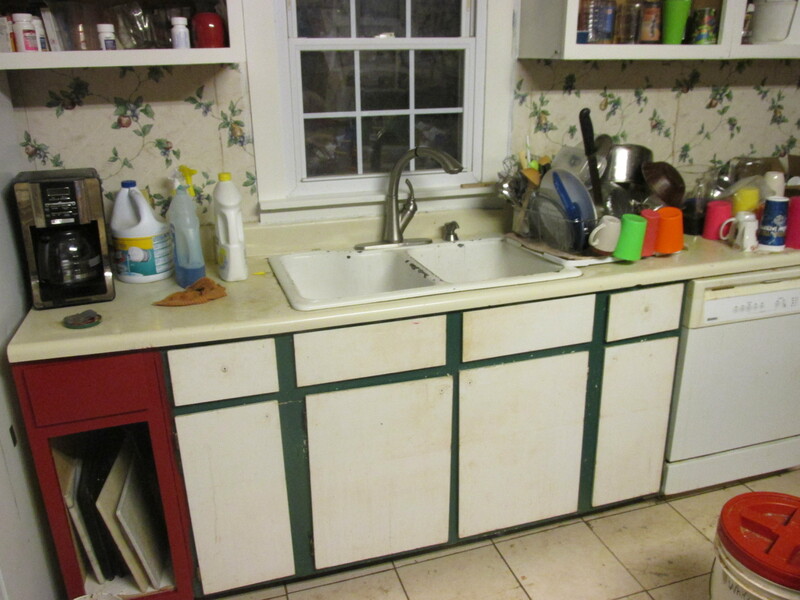 I was not pleased with my kitchen, nor with the rapid destruction of the white surfaces once they had been cleaned. The contrast of green frames and white doors made my kitchen feel too busy and confining. I yearned to do something different. I got desperate and searched Lowes online for a 12 foot counter top. They had one. It was smokey topaz, sort of a black granite look, only in laminate. So I ordered it along with a new base cabinet and some desperately needed new appliances. Then I needed to figure out paint. A friend whose decorating opinion I trust suggested that I do all white cabinets. I said, “NO WAY, been there done that!” So she suggested I do a dark color on the bottom and white on top. Hmmm…..now that was an intriguing idea. I am so tired of the wall paper I put up 15 years ago, and the wall seams are all cracking, so now my paper looks awful. Bead board to the rescue! 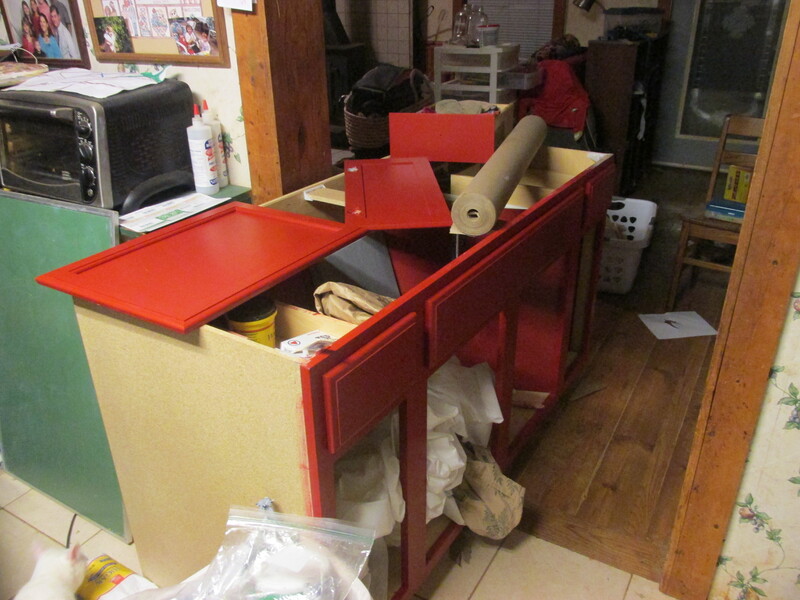 I chose a dark red for my bottom cabinets, and a winter white for the bead board and upper cabinets. My two large pantry (floor to ceiling) cabinets will be red as well. Why, yes, we do school through it. This is normal, right? Part of my healing process has been recognizing when I am out of my league and asking for help. Some of my church friends came last week to help me prime and paint. My brother Eric came yesterday. The other new thing for me is being bold. My kitchen has been white and green for a long time. It was safe. I am branching out into happier colors! Ann happily brought her paint supplies and was ready for action! Inconvenient place for a sink base cabinet. The base cabinet is still in the middle of my kitchen and living room door, and as soon as the Handy Man is finished with the bedroom, that will be the first kitchen project we tackle, aside from the paint. We discovered that our current kitchen sink has a crack in the bottom. It is enameled cast iron, and the crack is on the under side, so we did not notice it, but Gladys Mae was cleaning under the sink and did notice it. Thanks to her good eye, I have a new kitchen sink, too. I chose to go with stainless steel for two reasons. First, enameled cast iron looks horrible once it has a few chips. Mine has more than a few chips. Cast iron frying pans will chip enamel. I use a lot of cast iron. Second, the enameled cast iron sinks in my price range all have a raised lip like my current sink does. It drives me crazy that when I use a dish rack to dry dishes (as we have for all the dishes for quite a while since the dishwasher quit) the rack must be elevated or water pools below the rim. A low sink edge will eliminate that issue. The Handy Man wanted a two basin sink, but I liked the idea of having a sink large enough to submerge my big cookie sheets. I found a sink that has a removable second basin as well as a strainer and a cutting board that all fit the rim. It looks like the perfect compromise. I cannot wait to get it installed! This base cabinet is going…..the window is now a pretty winter white. The new dish washer is black. So it is crunch time around here. A bedroom that must be finished by this weekend, and a kitchen that must be finished in ten days are going to push us. I am excited about the changes happening! 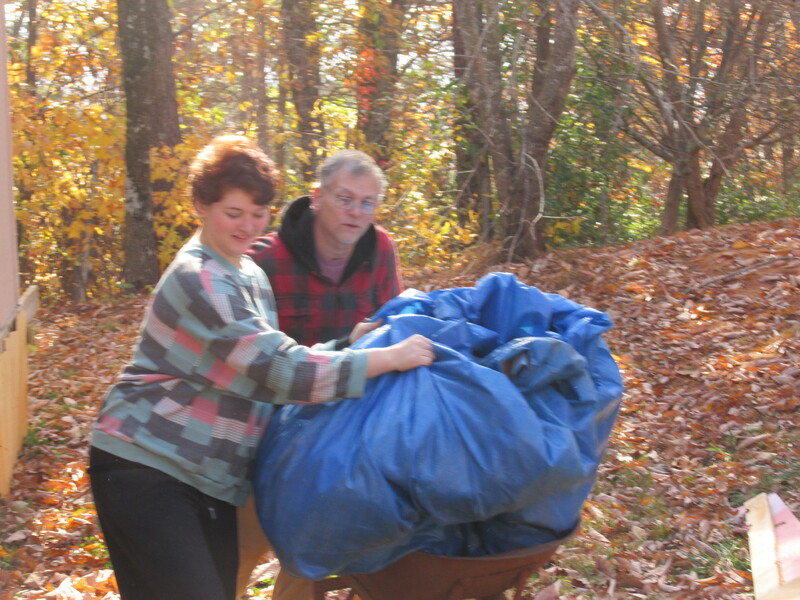 This entry was posted in Uncategorized and tagged busy family, crunch time, handyman, homeschooling, remodeling. Bookmark the permalink.